YOUR GROCERIES BROUGHT TO LIFE! Millions of players worldwide have already discovered on the fun, challenging, family-friendly, grocery bagging puzzle game Bag It! -- come see what all the fuss is about! Heavy, sturdy items on the bottom, light and fragile items on the top – seems simple, right? Think again! Bag It! will open your eyes to a whole new world inside your shopping bag! • 100+ unique levels! Try to get 3 stars and both medals for each - master them all! • Standard, Rampage, and Puzzle modes! • Seedy's Booty - an all new matching challenge mode! Collect coins, buy power-ups, and see if you can best your Facebook friends! • 3 endless modes - Ultimate Bagger, Endless Rampage, and Power Surge! • 30+ GameCenter Achievements and Leaderboards! 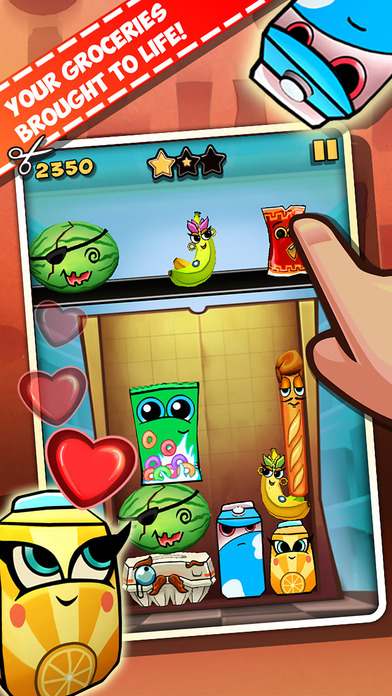 • Your grocery characters come to life - it's like "Tetris meets Toy Story"! • Unique grocery combos - try to find them all! • Custom tailored translations in 7 languages! Reach out to us directly at bagit@hiddenvariable.com and share it all. We promise to get back to you personally. Seriously! - Changed app name to "Bag It! Classic"